There are four options for buying a boat: you can purchase a new boat from a local Australian dealer (Whether it’s made in Australia or overseas), purchase a 2nd hand boat from a private owner or boat broker, import a boat from overseas through a boat broker, or import from overseas directly yourself. Many people feel that if they’re going to purchase a boat, it’s better to get a new one instead of potentially buying someone else’s problem. New boats have several benefits, including warranty coverage, the availability of servicing contracts and the relative ease of purchasing one, especially when it comes to obtaining financing and insurance. There’s also the “newness” factor, or the feeling that you get when you purchase something that’s never been owned by anyone else, and the feeling of pride and esteem you get when you show it off. When you buy a new boat, you’re likely getting the newest technology available and the latest design. A new boat also gives you a greater range of options for choosing colour and upgrades, and you’re helping the Australian boat industry and economy by purchasing locally. The downside of buying new is that the price is generally higher than buying a boat that’s a few years old. Also the resale value may not be as high, due to the nature of depreciation. There could also be some delivery delays if the model you want isn’t in stock and the boat has to be brought in from elsewhere. You may like the idea of buying locally from a private owner, so that you can go and physically see and inspect the boat. On the con side of buying privately, you may need to travel interstate and you still may not find the make or model of boat you wanted, private owners in Australia tend to set their prices higher than the market value, and it’s a little more difficult to haggle. It’s a benefit if you have a chance to see and test the boat in person and have it checked for seaworthiness and mechanical soundness. If you’re purchasing from an Internet ad or a website, you run the risk of purchasing someone else’s nightmare instead of the boat of your dreams whether its located in Australia or overseas. If you choose this route, beware of seller misrepresentation, whether it’s intentional or not. An independent report is a must if you are not able to physically test the boat yourself. One of the more popular options is to import a boat from the United States. There are several reasons for doing so, including the wider selection of popular makes and models, the craftsmanship of some foreign-built vessels, larger size and the lower price due to the current strength of the Australian dollar on the world market, versus U.S. currency and economy. Boat brokers eliminate allot of the risk of purchasing from overseas but they charge for their time and efforts. They are experienced in the process and usually have contacts to find the boat your after, they save you the time it takes to track down a bargain surfing the net. You need to be sure you have reputable boat broker as there are some unethical brokers out there so getting references is very important. This option has the highest risk involved but the greatest reward. It’s not unusual to save up to half off the ordinary cost of purchase, meaning you can get a lot more boat for the money, and even resell for profit after using it for the summer. When you’re dealing with an international transaction, you have very little reliable information to go on, especially if you’re purchasing from a private seller. Though this is true of almost anything you buy sight unseen, it’s a major consideration when you’re make a financial commitment this big. Modern transactions can be insured, to some extent, and you’re safer working through an online auction or eCommerce site that provides some accountability and buyer protection. However, if you’re buying used or from a private dealer, you still have the issue of no financing or warranty available on the merchandise. Scams are an unfortunate part of doing business in the electronic age. Whether it’s a simple case of misrepresentation of the item or outright fraud, scam artists are usually skilled professionals at their trade. Scams are difficult to catch in advance and it could take years and a lot of unnecessary expense to get a favorable resolution. Arranging the shipping and storage of your vessel on your own could lead to hiring a substandard or unsafe shipping method or company; this could cause your boat to be much less seaworthy upon arrival. Novice importers are often unaware of the potential for hidden cost in such a large transaction, especially given the the complications of taxes, quarantines, shipping and storage fees and other expenses you may not know about, or may pay too much for, unless you have knowledge of the marine import industry. Some of the biggest headaches regarding the import of any merchandise are the legal requirements involved. Some things that can cause huge delays if you don’t know the requirements are getting the proper permits for transport and storage, registration on both sides of the transaction, compliance with international and interstate laws in relation to vessel and trailer sizes, and conversion of money and electronic or other equipment that may not be compatible locally. 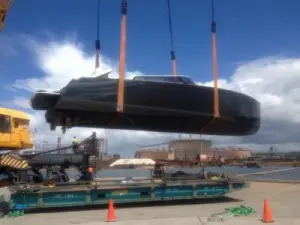 Local boat dealers, in defense of the Australian boat builder’s industry, also don’t like to service grey imports, and will either refuse outright or charge you more money. Hi Bob, thank you for your question, our sales team will get back to you. Please let us know the make/model and year of manufacture of the vehicle so I can give you the correct information. All vehicles imported manufactured after 1989 must go to the RAWS workshop for compliance. Great Information, thanks for the Guide to Buying & Importing a Boat to Australia, It is so much useful. Thanks.